Management of Refractory Diabetic Gastroparesis: Too Pace Or Bypass? Diabetic gastroparesis (DGP) affects up to 40% of patients with type 1 diabetes and up to 30% of patients with type II diabetes. DGP typically causes nausea, vomiting, early satiety, bloating, and postprandial fullness. The standard treatment of symptomatic DGP consists of tight glycemic control (glucose levels, <150 mg/dL), dietary manipulation, and medications. If those nonsurgical therapies fail, therapy may consist of gastric pacer implantation (Enterra). The exact mechanisms of how gastric bypass (GBP) impacts body weight and glucose metabolism are incompletely understood. The rearranged anatomy of GBP facilitates the entry of food into the jejunum, bypassing the remaining neuroendocrine and physiologically functional stomach, duodenum and proximal jejunum. Obesity-related diseases dramatically resolve or improve after bariatric surgery including diabetes resolution ranging from 60-85%. At our center, we have successfully adopted laparoscopic gastric pacer for refractory DGP. However, patients with morbid obesity with obesity related co-morbidities and severe diabetic gastroparesis remain under studied. We report our experience of four patients with severe medical refractory diabetic gastroparesis and morbid obesity. All patients underwent an extensive pre-surgical workup that included biochemistry evaluations, upper endoscopy, radiographic imaging, and functional studies including four hour solid phase gastric emptying studies. All four patients had medical management for their DM through an endocrinologist and suffered from gastroparesis for greater than five years managed by a gastroenterologist. Two patients met criteria and underwent gastric pacing and two had standard laparoscopic gastric bypass, based on NIH criteria. Data analyzed included improvement in gastroparesis symptoms, glycemic control, body mass index change and co-morbidity change. The two patients that underwent gastric pacing had poor symptom control after one year of frequent gastric pacer interrogating and subsequently underwent gastric bypass with removal of the gastric neuroregulator and gastric leads. All four subjects were females with a mean age of 43 y/o (range 37 to 54y/o), mean body mass index of 36.8 kg/m² (range 35.7 to 38.59). All underwent laparoscopic gastric bypass and additionally had a gastric remnant tube placed into the gastric remnant. The intent of remnant tube placement was to avoid complications from acute remnant distention and provide decompression in order to improve symptoms. Remnant tube placement resulted in partial improvement of gastroparetic symptoms in 3 of the 4 patients. All subsequently underwent gastric remnant resection to provide attempts at long term symptom control. All patients reported significant improvements in nausea, vomiting, bloating, oral intake and overall quality of life. Median BMI was 25 kg/m² at 1 year follow up. Median BMI preprocedure was 36.2 kg/m². Glycemic control as measured by fasting glucose was 155mg/dl. Other co morbidity improvement includes but not limited to anxiety, GERD, osteoarthritis. 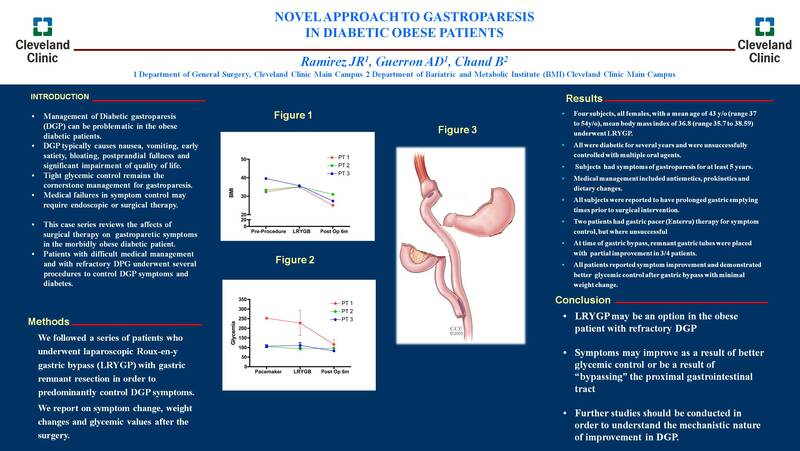 The management of severe DGP in the morbidly obese patient remains challenging. Laparoscopic gastric bypass appears to offer superior glycemic control which may in turn improve gastroparetic symptoms. Remnant resection at the time of gastric bypass may offer increased symptom control. Increased studies are required to help delineate exact mechanisms of action and provide an appropriate treatment algorithm.